Srinagar, Aug 15: Jammu and Kashmir Governor N.N. Vohra said on Wednesday that he hoped that the new government in Pakistan will realize the futility of continuing the agenda of terrorism in the state. 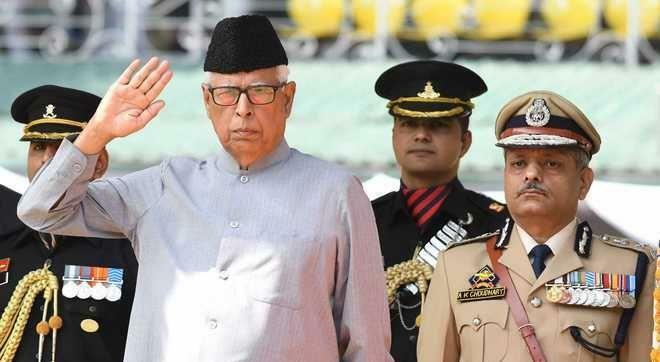 Addressing the main Independence Day function at the Sher-e-Kashmir Cricket Stadium here, Vohra said: "I hope the new leadership in Islamabad will realize the futility of continuing with the terrorist agenda in Jammu and Kashmir. "Our Prime Minister has tried many times during the last four years to extend the hand of friendship to Pakistan but there had been no positive response so far." "Our Army and police forces carried out effective operations and neutralized perhaps the largest number of terrorists in the past many years. "At the same time, we also suffered loss of security personnel and civilian lives." "I appeal to teachers, parents, religious and social leaders to use their influence to ensure that these youths return home. "At the same time, it is encouraging that some of them have returned to their homes. He said ever since he took over the reins of power after the imposition of Governor's Rule in the state, he had been trying to ensure that the administration worked with accountability, speed and transparency. "The establishment of basic democratic institutions is the top priority of my administration," he said adding that urban local body elections and those to the Panchayats in the state would be held before the year-end.